About a year and half ago I embarked on a voyage of discovery through Cyberspace. I had been just another average internet user until one winter day early in 2007, when I said to myself: "I'm finally going to create that website I've been talking about." web hosting, when I could have had a free hosted blog up and running in a matter of minutes. But I wanted a "real website." I finally got a few websites running, which lead me to branch out further. I began exploring the blogosphere in greater depth. Then I created my own user page on Wikipedia, under the name of Redeyed Treefrog. And in late November of 2007 I joined Second Life. A few weeks later I created this Second Life blog, which rapidly acquired a larger audience than all of my other websites taken together. Through my involvement in Second Life, and in particular through reading Prokofy Neva, I began to investigate social software. I would have hesitated to join most social sites using my real name, but I found it easy to sign up as Danton Sideways. Thus Danton is now present on Twitter, Plurk, Facebook, FriendFeed and several other such sites, where my "friends" are for the most part other Second Life avatars. I've become an Early Adopter. Now I'm taking what for me is the next logical step: I'm going Open Source. And I've created for the occasion a separate Open Source blog. I've mentioned in a previous post on this blog my interest in the approaches to tools developed by counter-culture philosophers such as Ivan Illich and Stewart Brand. I've also stated that I consider free software guru Richard Stallman to be a saint, and Microsoft to be The Beast. So of course Prokofy Neva's continual diatribes against Open Source leave me unswayed. I am personally convinced that Open Source can stand up against the criticism that is directed against it on economic, legal or moral grounds. But I would prefer to leave the polemics to others. Instead of spending my time and energy arguing about Open Source, I'd rather just put Open Source to use. I recently took a tour of several new grids that use OpenSim, which is the Open Source version of Second Life. OpenSim was created through reverse engineering of the Second Life software. At the risk of skirting the type of polemics I want to avoid, I might observe that reverse engineering is one of the grey areas of Open Source practice. In some cases it clearly involves infringement of Intellectual Property rights, but in other cases Open Source is more a matter of legitimate establishment of universal compatibility through open standards. Thus the IBM PC became the main international standard for PC computer hardware, because so many companies could easily make IBM clones. A rather different case is OpenOffice, the open source office suite released by Sun Microsystems, which provides a legitimate alternative to the detestable monopoly of Microsoft (the latter still uses every trick in the book to subvert the establishment of universal standards in this domain). And the benign, or at the least neutral, attitude of Second Life towards OpenSim has been explained as a form of enlightened self-interest: if the Second Life software becomes the basis of a new widely-used standard, this could reinforce the position of Second Life with respect to its competitors. After taking my tour of the OpenSim grids, I wanted to learn more about the OpenSim software. I had to learn to use IRC, so that I could follow the discussions on the #opensim channel on freenode. I downloaded the IRC software program XCHAT, and on June 3d I connected to the #opensim channel as user "Danton." I got chatting with someone called "nebadon," and gave him the link to my blog post about the OpenSim grids. That evening I learned from the #opensim channel that there was a meeting inworld on the OSGrid to discuss OpenSim. I logged into the Wright Plaza sim and found about 30 avatars standing around, talking about technical problems. Most of them appeared in the default Ruth avatar, but some had elaborate avatars, and a few were dancing wildly. Nebadon suggested I give everyone the link to my post, which several had already read and found well-written. After a few minutes the public chat went strangely silent, but the dancing avatars were still prancing madly about. I went back to the IRC chat, where I was informed that the sim had crashed. 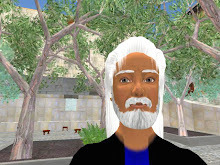 In Second Life I have had my viewer crash, but have never experienced the crash of a whole sim, so I failed to understand that the avatar dance scripts keep on going in one's viewer, long after the sim itself has crashed. I started trying to fool around with the OpenSim software itself. I downloaded a binary version, and got it running in standalone mode on my home computer. Around that time I discovered that Ugo Trade has written a series of fascinating posts about OpenSim on her blog, including one that gives a list of OpenSim blogs, and another that introduced me to TribalNet. As I tumbled further down the rabbit hole into the subterranean depths of OpenSim, I began to conceive of writing a series of blog posts describing what I found. But the present blog is devoted to the adventures of Danton Sideways in Second Life. I therefore reactivated an unused blog for Danton Sideways that I had created several months ago, as described here. I gave that blog a new name referring to "Open Source", and have already posted on it an article describing how I got OpenSim running in standalone mode on my PC. News about Danton Sideways in Second Life will continue to appear here on the present blog. Henceforth, news about Danton Sideways in OpenSim will be given on Danton's Open Source Blog. How many separate lives can one little avatar have? Hi Danton. I know people say that OpenSim was created through reverse engineering but I really don't regard this as accurate. As defined on wikipedia, reverse engineering is the process of analyzing source code or a binary to recover information about its internal operation. OpenSim has not done this. Rather, I would say that OpenSim is a general virtual worlds server that can speak the Second Life protocol as implemented largely by the libsecondlife project. Thanks, Justin, for this clarification. It is true that the OpenSim project was started after Linden Lab released the open source version of their viewer, so OpenSim can be seen as an entirely legitimate effort to produce an alternative virtual world server that would conform to the Second Life protocol. But as you note, OpenSim was in practice developed to conform to the Second Life protocol "as implemented largely by the libsecondlife project." The next question is therefore whether libsecondlife was developed using reverse engineering. In the period before Linden Lab released the source code for the Second Life viewer, the libsecondlife developers used two tools to analyze how Second Life works. The "Snowcrash" tool allowed viewing the packet data sent and received by the Second Life viewer, and the "Slice" tool dumped the Second Life cache contents to the user's hard drive. Just to be clear about this, I'm interested in knowing whether the use of those tools in that context could be considered "reverse engineering." Open source = closed society. I have to laugh at all the contortions you are going through to make a website or work a standalone sim, as if taking part in all these arcane tekkie rituals now sanctifies you as "independent" and never to be in a horrid "walled garden" Mon Dieux! the horror! again. Meanwhile, other people use the walled garden technologies of blogging tools for dummies, they use SL, and therefore they have more access to technology, and more openness, and less need for connections and arcane knowledge and rituals. No one has figured out how to make open-source pay -- it's a shill. The only formula they use is "Your information wants to be free, mine's available for a consulting fee, however," and that's immoral and unethical. Libsl began reverse-engineering LONG before the Lindens open-sourced their viewer or announced they planned to open source their server code, and this is well-documented. OF COURSE sniffing the packets and whatnot IS reverse engineering, open sim work is based on that and IS reverse-engineering, too. This is well known and explained by the participants themselves. Except some participants lurch from defending reverse engineering as "not wrong," although it is unethical and often illegal, and some then at least acknowledge it's wrong, and then work overtime to hustle you into believing no reverse-engineering took place. I'm not surprised that you'd gravitate to all this OSS nonsense being a socialist. The question is: do you have a day job to pay your bills? Of course there's a lot of truth in what you say, Prokofy. Also, I fully recognize the validity of walled gardens, intellectual property and the profit motive. But I still think there are powerful arguments in favor of Open Source, though I'd rather let the specialists do the arguing. Let me just respond with a few personal reactions. I believe it is possible to make profits using Open Source. But the real force of Open Source is in the way that it permits mass collaboration on the basis of motivations other than economic interest. All of the anonymous heroes who contribute to Wikipedia, for instance, undoubtedly have a great many different types of motives, but economic profit-seeking appears to be virtually absent from the list. Or consider "Saint" Richard Stallman: it seems that at one point he was living out of a small office that he had on campus, so the original initiator of GNU/Linux was clearly motivated by something other than the search for profit. The profit motive and the free market are essential for making the economic system work, through the principle of Adam Smith's "invisible hand." But the profit motive is a small subset in the enormous range of human motivations, and many of the others are vitally important as well. As for "reverse engineering," I admit this is a grey area. And I want to remain a law-abiding citizen. Here again, I'd rather leave the arguing to lawyers. But there comes a point in the development of a specific technology when the establishment of open standards becomes to everyone's interest. Instead of each company making nuts and bolts to its own idiosyncratic specifications, the diameters and threads are standardized for interoperability. As are telecommunications protocols, data formats and so on. While some cases of "reverse engineering" are clearly illegal, others sit in that grey area where the development of interoperability may be in the public interest. The litmus test would seem to be the legal system. As long as Linden Lab refrains from initiating court action against OpenSim, it would appear to be alright for me to continue to play with it. And yes, I have a day job to pay my bills. The motivation is often not real altruism, but merely vanity and power. Richard Stallman isn't a saint; he's a freak. Linux is merely a totemic device for freaks to identify each other and pretend they're creating an alternative to the Beast, "Windoze," but they never make anything that any normal person could use, so they are frauds. Please tell me how you personally are profiting from open source. I love testimonials, Dusan. Do tell! I think one of the greatest shills that the open-source movement perpetuates is to talk about "open standards" in the same breath as "open source" or free software or community/collective-built software. I'd prefer the term "universal standards," and of course you can have universality and the rule of law without having everything free and "open" in the sense of being stealable. I think it's a sleight of hand when something larger demands "open standards" as merely a scam to get something smaller to cave and be enguled by it, and that's how we keep seeing things being done in Second Life. There is nothing wrong or evil or unlawful about the profit motive, and capitalism; indeed, your challenge is to explain why you persistently flog this tiny insignificant socialism cult when there isn't a single world example of successful socialism; even Sweden, which had the advantage of Swedes to implement it, is on the rocks with that sort of social system. I don't see that there's necessarily some absolute social good in making everybody have "open standards" when in fact perhaps there's something to be said for each world, like each country, having its own ways and culture and economic regulations. That's how it is done pretty successfully in the real world; it's funny how socialists who hate globalization in real life are all for it on the Internet, but only because they think it delivers them, as the technical elite, some peas in their stone soup pot. I'll gladly make confessions and testimonials, Prokofy, though I fail to see what Dusan has to do with this. Wrong window? One confession is that I know exactly what you mean about altruism often being a cover for darker motives concerning vanity and power. The French sociologist Pierre Bourdieu has developed a theory that people seek to accumulate "social capital" in addition to material wealth. For example, academics seek to accumulate publications, citations to their work by others, invitations to speak at conferences, and so on, which constitute their "academic capital." Maybe Richard Stallman was motivated by a drive for power and fame, but I would consider him a saint anyway. My own personal interest in open source, as I've said often enough, is that I consider it to be an application of what Ivan Illich called "convivial tools." Illich wanted ordinary people to have greater mastery of technology, which means giving them access to the inner workings of tools, rather than surrounding them with black boxes. Windows is a black box, whereas Linux is transparent. We should develop tools that ordinary people can learn to take apart and put back together again, and this is one characteristics of open source software. Of course, only a small handful of people actually have the time and the energy to learn programming, but the challenge is to make it easier for us all. The convivial approach to making things easier is to open up the guts of the technology for hands-on tinkering, rather than sealing off the inner workings behind impermeable interfaces. Bah, Ivan Illich. Re-warmed 1970s leftist social theory that has ruined the public schools. Convivial? Communalistic. And Windows isn't any black box: I can easily use it, and easily troubleshoot it as a non-tekkie. But Linux, forget about it. Linux is the black box. You're looking at these issues through the geek keyhole again. Um. This is a flame war. To wrap ur head around it ya got to put on the other person's hat and successfully argue their POV. Then ya can do analysis and synthesis, if yer into more than waiving white and black flags such as "Show Me The Money" or "Your A Communist". To be honest yer bookshelves are probably identical. Your comment, bwildasi, at first seemed to me to be mild griefing, and I was tempted to delete it. But when I thought about it, I realized you're probably right. Prok and I probably have read a lot of the same books. Danton, I always mix you and Dusan Writer up, I guess because you are both socialists and start with "D" lol. I can't imagine why you'd delete that guy. Plus, I bet we've read very different books. Prokofy - A comment that starts by talking about flame wars and POV (when you accuse someone of expressing point-of-view on Wikipedia it amounts to an insult) arouses my suspicions. But when I read it to the end and thought a moment I realized the person is ok, although bordering on the irrelevant. And I'm sure we've read some very different books - but maybe (just maybe) we've also read many of the same. Anyhow, it's been a while - how are you doing?